THE DEATH from cancer of David Shepherd at 68 has shocked the cricket world and left a void only four seasons after his retirement as an international umpire. He was such a familiar figure, with his portly build, weather-beaten face and mop of white hair. His eccentricities, most notably hopping discreetly in mock anxiety whenever the score reached the bad luck 111 or multiple, but behind this he was a very sharp umpire, standing in 92 Tests and 172 one-dayers. He officiated in six World Cups, including three finals. David Shepherd MBE, a former Gloucestershire batsman, was a good talker to the players around him and was keen to discuss his mistakes with apologies if warranted, as a man with humility. And the Devonian had a sense of humour. Once at Taunton when a bowler held up play by bowling looseners to mid-off 'Shep' signalled wide to the scorers. He almost gave up umpiring when he was put under the severest media scrutiny at the England-Pakistan Test match at Old Trafford in 2001 for missing no-balls by Wasim Akram that resulted in wickets. Torn by self-doubt he was hurt by the criticism, but it was shown that Akram's rapid run-up and incredible arm speed made accurate judgement by eye of the bowler's foot placing very difficult. Carefully no-ball scrutiny was almost impossible because, in Akram's case, umpires had so little time to adjust their vision from the crease to the ball in flight, making lbw hard to judge too. Fortunately Shepherd did not resign and saw out his full term with the ICC until retiring in his 65th year. If Shepherd had reached this age a couple of years later, he would probably have continued umpiring beyond the retirement cut-off in view of legal opinion on ageism in employment. The current international umpires issued a moving collective tribute to a former colleague who was universally respected within their number. "Shep was one of the truly great cricket umpires that we have seen but more importantly he was one of the true gentlemen of the game of cricket," said a statement. "The international umpires will fondly remember his smiling face, his warm personality and his ever helpful demeanour. Shep helped so many umpires in so many ways and contributed to numerous umpiring careers – many are indebted to him. Every time we see nelson on the scoreboard, we will be thinking of Shep’s little jig and saying a quiet ‘thank you’ for having him as one of us. "As Shep would always say to every umpire he worked with on the way out to the middle, we now say to him: ‘Good luck mate, and may your God go with you.’ Shep may have left us but his legacy of excellent people-management and top-class umpiring will remain with us forever." 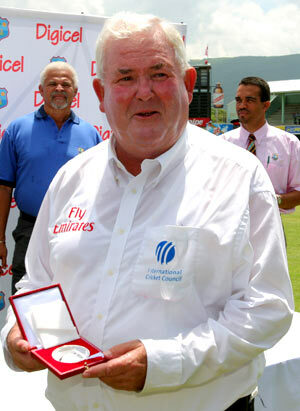 ICC president David Morgan has expressed his sadness. "David was a true gentleman of the game," he said on hearing the news. "He was a fine player and a match official of the very highest quality. He will be remembered fondly by players, spectators and administrators who saw him as a great entertainer but also as one of the best umpires the game has ever seen." David Collier, the ECB chief executive, said that he was deeply saddened and added: "Shep was not only one the greatest umpires of all time but he was also a friend to all involved in cricket. "His cheery personality created a wonderful atmosphere at every match in which he was involved and he will be sadly missed by everyone involved in cricket throughout the world." CHARLIE SAYS: He was excellent from the media point of view as a friend and professional. He would readily give a 'quote' on a current umpiring issue simply to help us out. He was reticent by nature, but hated to let anyone down.